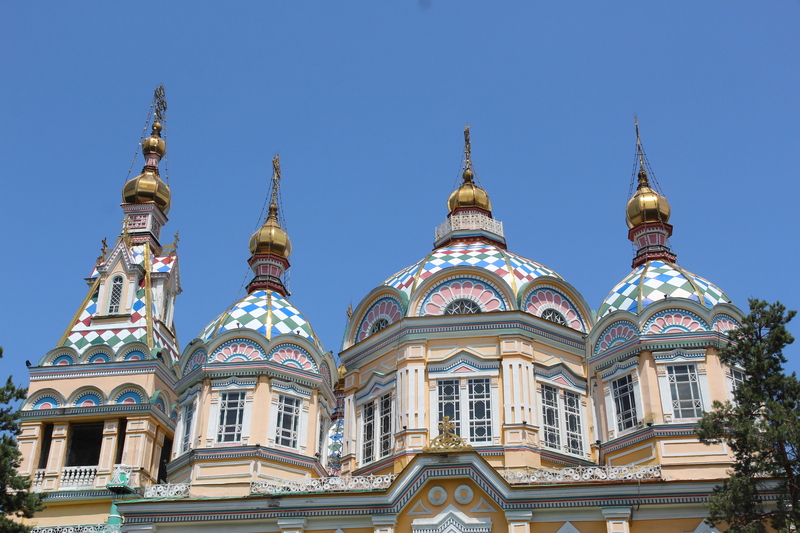 A gingerbread cathedral in Almaty | Where to next? 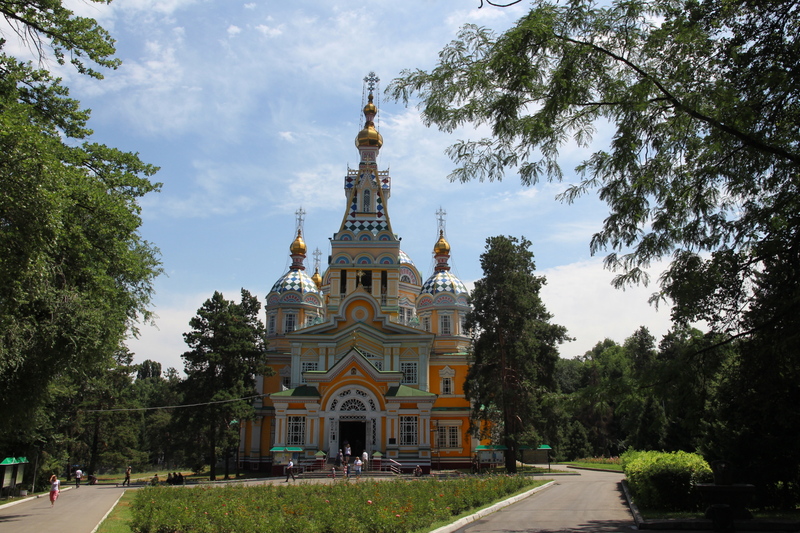 After the childish performance by a haggy old woman at the St Nicholas Cathedral in Almaty, I thought I ought to tell you about our visit to the city’s main house of religion—the Ascension Cathedral, also known as the Zenkov Cathedral. I had heard that this was a very picturesque building, but having never seen a photo of it, I was not quite prepared for just how beautiful it is or how much it reminds me of a gingerbread house or a fairy castle. 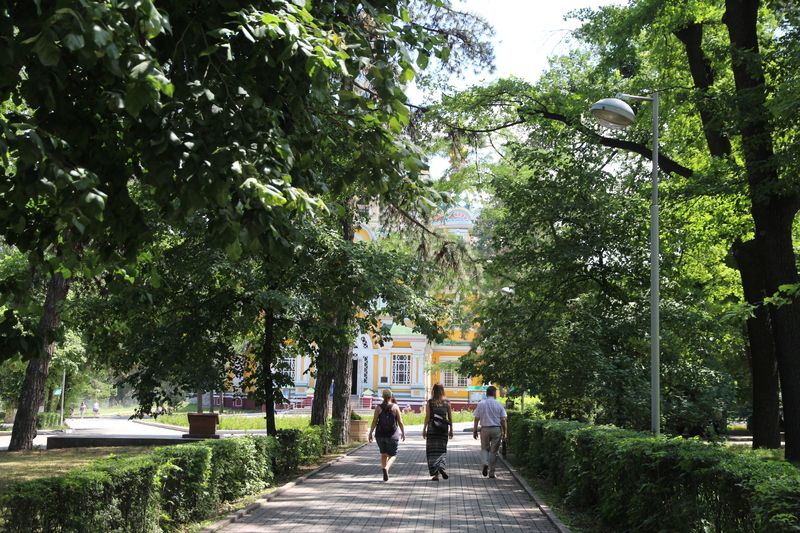 The rooflines, angles, curves, arches, domes, windows, trim, gold and colours all work together to create an enchanting structure that emerges from the trees in Almaty’s Panfilov Park. We’re lucky the cathedral is here at all. Many important buildings from the tsarist period were destroyed in an earthquake in 1911. As Poor John and I entered, we noticed the ‘no photos’ sign on the door (along with the no dogs, no ice cream etc signs), so I parked my camera at my side and strolled around admiring the art and architecture. That was until a woman, who might have been the cleaner, came up and insisted that I take photos. With a mix of Russian and a few stray words of English, she made it clear to us that photos aren’t allowed during services (this was a Monday afternoon) or at night. But photos now were fine. So I snapped a couple of the interior. Later we noticed her talking a bit anxiously and at length to the young priest. Was she confessing to letting us take pictures inside? We’ll never know, but he gently patted her hand and said something that looked like There, there, everything is okay, so we stopped worrying and so did she. Work on this cathedral took place from 1904 to 1907. It is supposedly built completely of wood and without the use of any nails. If you go around tapping on surfaces, it all sounds like wood. Some of the interior was built in artistic workshops in Moscow and Kiev. I read that it is the second tallest wooden building in the world, but after numerous online searches, I can’t confirm that nor can I determine which is the tallest wooden building. Do you know? 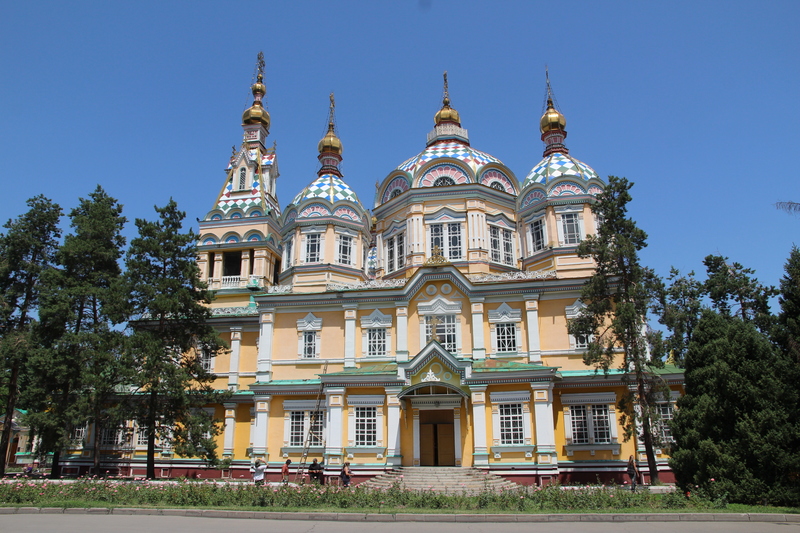 After the Revolution, the cathedral housed Kazakhstan’s Central State Museum and was a venue for concerts and other public events. Almaty’s first radio transmitter was installed in the belfry. At some stage, the cathedral was boarded up, but restoration work was carried out in the 1970s and again in the 1990s. 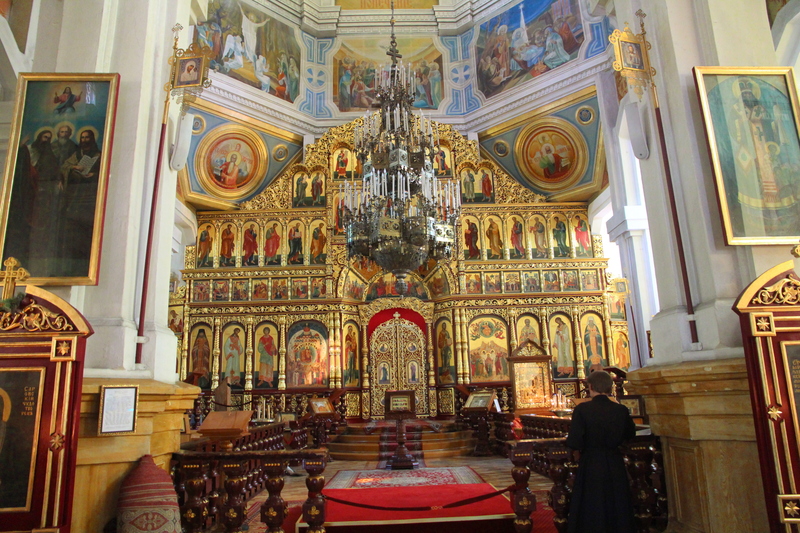 Control of it was returned to the Russian Orthodox Church in 1995 and religious services recommenced two years later. What a beautiful building! I’m so glad you got some photos of the interior, too. I feel lucky just to have seen this magnificent building. It has a wonderful mix of styles and colours. Wow how amazing Peggy, glad you’re having such a wonderful trip. Thanks! Having a great time. When do you two head out on your travels? Peggy, that cathedral is magnificent. Thank you for posting the gorgeous photos. So glad you like it. We did too. Amazing! No nails! Such artistry and craftsmanship! I feel so lucky to have seen it up close and in person. Very nice, Peggy! Such a beautiful church and lucky you & PJ! Many wood structures built in the US burned over the years and today no more than four stories in most cities can be of wood construction so around 40-50 feet or so depend on the building’s use. That’s so interesting. I had no idea about those regulations in the USA. Thanks. Very childish behaviour from a grown woman (not me) | Where to next?